File filter workflows are a fantastic way to create filtered searches where you specify the file types you want Alfred to search and/or the locations you want him to search in. Why create a file filter? A file filter allows you to narrow down your search to particular file types you want to find, making it easier to locate the file you need. Rather than add every possible file type to your default Alfred results, or trawl through an unfiltered list of all files that match your search term, these finely focused filters will help you find the results you need in a moment. You can then trigger the file search using the file filter keyword or adding a hotkey. First, you'll set the File Types you want to search. Leave this blank to search all file types, and specify the search scope instead. To add File Types, drag files of the type you want from Alfred's results or from Finder into the File Types box. Alternatively, type their UTIs (Uniform Type Identifier) in. When typing in the file types, you can add a specific ContentType or add a ContentTypeTree to broaden the file types. The ContentTypeTree goes from the most precise classification (png) to the broadest (content), so if you'd like to include anything that conforms to the public.image ContentTypeTree, press the + button and add a "+public.image" entry. Sounds complicated? If you're not sure, don't worry about it. You can just drag a png, a jpg and a gif into the File Types box instead to include these multiple file types in your filter. You can specify a search scope by dragging one or many folders into the Search Scope tab. Only check the box to show files marked as System File if you really need to include these, as they'll otherwise add noise (and seemingly strange files) to your results. Optionally, you can set a date range (today, last 3, 7 or 30 days, or older than 30 days) for when the file was created or last modified. By default, Alfred searches the display name, file name and Finder comments added to the file, which is usually sufficient to search for files by name. If you need to search further fields, such as macOS Tags (kMDItemUserTags), you can add these fields here. You can exclude fields with the NOT column. The simplest example using the File Filter is to connect this workflow item to an "Open file" action to filter for folders only and open them in Alfred. The placeholder title and subtitle is displayed in Alfred's results until the File Filter search query text returns results. Below, you'll find an example workflow created to search for PDFs in your Documents folder. You'll also find a tutorial on creating a file filter workflow on the blog; You'll learn how to create a search for images which then opens your chosen result in Safari, and how to add a hotkey so that you can trigger the search with a custom hotkey. In this example, let's create a file filter that searches only for PDFs in your Documents folder. If you're searching the contents of this folder every day, it makes it much quicker to create a search like this rather than manually navigating into the folder every time. Click the + button in the bottom left of the preferences and select Templates > Files & Apps > File filter from keyword and open. Give your workflow a name and a bundle ID. Drag a PDF file to the "File types" box so that Alfred knows you want to search for PDF files only. You could now save your workflow and be all done, but let's add a few more improvements. Optionally, you can set an icon for your workflow by dragging a pdf file or an icon of your choice to the image well that says "Drop an icon above". Want to set the search scope to only search specific folders? Go to the Advanced tab and drag in the folders you want to search in this workflow. Here we'll add the Documents folder, but you can add as many as you like or leave it blank to use your default Alfred search scope. Want to give your workflow a clearer name? Double-click the workflow in the left sidebar to set a name and a description, then click Save. Now launch Alfred and type "pdf" followed by your keyword and you will see that only folders will appear in your filtered search. Congratulations, you've created your first workflow! You can now create filters like this but drag different file types to filter only folders, images, text files and more. 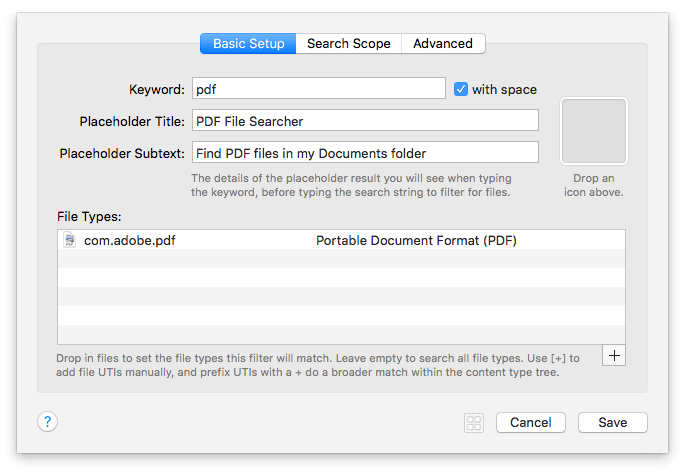 Download the PDF File Searcher workflow to see how you can easily create your own file filters and search your Mac more efficiently.